National Wine Centre – Gallery Room, Mon 4 Mar. This show might just win the award for the silliest thing on offer at this year’s Adelaide Fringe! 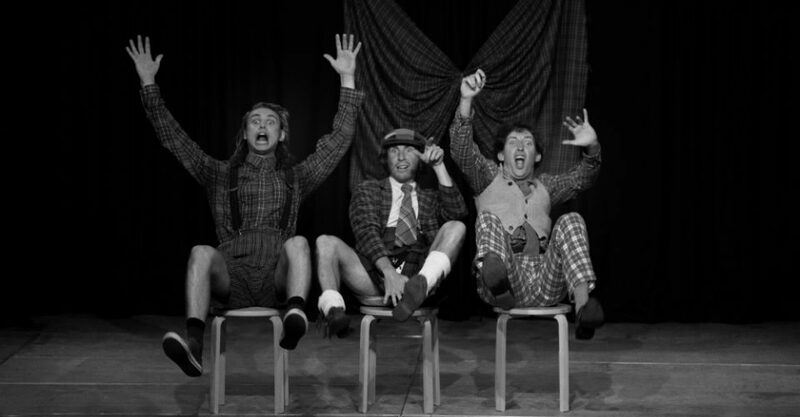 Three grown men – Jonathan Tilley, Oliver Nilsson, and Sam Dugmore who collectively make up The Latebloomers, prance around on stage for an hour doing ridiculous, supposedly Scottish, things in the name of comedy. The fact that none of them are Scottish removes the fear that this show is for a select audience only! All three are blessed with extraordinarily expressive faces, and much of the humour comes from their facial reactions to what is going on around them. So good in fact, that my eyes keep jumping from one face to another to take it all in. The show is extremely fast paced and it takes all the energy you can muster to keep up with everything that’s going on. There is no linear logic to the show, which jumps from fishing scenes to deer-stalking to whisky drinking to battle scenes, all ‘traditional’ aspects of Scottish life. Any attempt to make sense of what is going on is quickly dispensed with. At various times audience members are enticed to join in the shenanigans, but with only mimed instructions the participants are not always entirely sure what is required of them, as in a battle scene where our victim feigns dying in battle when they are supposed to be the victor. The mistake, of course, only adds to the humour. It is not all silent comedy. There is some verbal banter with the audience, and a running recitation of Loch Lomond. The show concludes with the audience being coerced to join hands and sing along to Auld Lang Syne. I leave the room wondering what I have just witnessed, but there is no doubt about the howls of laughter that these three clowns managed to pull from the audience. Scotland! continues at The National Wine Centre – Gallery Room from 7.15pm until Sun Mar 17. Madcap mayhem on the high road!